The Paleolithic Age, also known as the Stone Age, encompasses the first widespread use of technology—as humans progressed from simpler to more complex developmental stages—and the spread of humanity from the savannas of East Africa to the rest of the world. It is generally said to have begun approximately 500,000 years ago and to have ended about 6,000 B.C.E. It ends with the development of agriculture, the domestication of certain animals, and the smelting of copper ore to produce metal. It is termed pre-historical, since humanity had not yet started writing—which is seen as the traditional start of (recorded) history. Knowledge of human life at this time is confined to generalities. Scientists do not have records of individual lives or of the achievements of individual contributors to human development. As technology enabled humans to settle in larger numbers, however, more rules were needed to regulate life, which gave rise to ethical codes. Religious belief, reflected in cave art, also became more sophisticated. Death and burial rites evolved. As hunting and gathering gave way to agriculture and as some people became artisans, trading implements they produced, even larger settlements, such as Jericho, appear. Art (such as the cave paintings at Lascaux) and music also developed as some people had more time for leisure. Human society emerged as more self-consciously collective. People became aware that they faced the same challenges, so co-operation was better than competition. In the early Paleolithic period, each clan or family group regarded themselves as "the people" to the exclusion of others. Strangers may not even have been thought of as human. With settlement, this changed and community identity became more important than individual identity. The Paleolithic Age covers an immense time span, and during this period major climatic and other changes occurred, affecting the evolution of humans. Humans themselves evolved into their current morphological form during the later period of the Paleolithic Age. The period between the end of the last ice age, 10,000 years ago to around 6,000 years ago, is characterized by rising sea levels and a need to adapt to a changing environment and find new food sources. The development of microlith tools began in response to these changes. 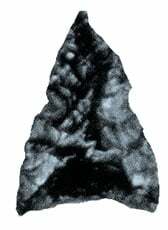 They were derived from the previous Palaeolithic tools, hence the term Epipalaeolithic. However, in Europe the term Mesolithic (Middle Paleolithic Age) is used, as the tools (and way of life) were imported from the Ancient Near East. There, microlith tools permitted more efficient hunting, while more complex settlements, such as Lepenski Vir developed based around fishing. Domestication of the dog as a hunting companion probably dates to this period. Japanese Jomon pottery is the oldest in the world. The Neolithic Age or the New Stone Age is characterized by the adoption of agriculture (the so-called Neolithic Revolution), the development of pottery and more complex, larger settlements such as Çatal Hüyük and Jericho. The first Neolithic cultures started around 8000 B.C.E. in the fertile crescent. Agriculture and the culture it led to spread to the Mediterranean, the Indus Valley Civilization, China, and Southeast Asia. Due to the increased need to harvest and process plants, ground stone and polished stone artifacts became much more widespread, including tools for grinding, cutting, chopping, and adzing. The first large-scale constructions were built, including settlement towers and walls (for example, Jericho) and ceremonial sites (such as Stonehenge). This shows that there were sufficient resources and co-operation to enable large groups to work on these projects. To what extent this was the development of elites and social hierarchies is a matter of on-going debate. The earliest evidence for established trade exists in the Neolithic with newly settled people importing exotic goods over distances of many hundreds of miles. 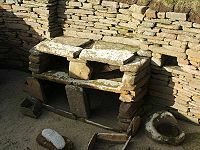 Skara Brae, located on the Mainland of Orkney off Scotland, is one of Europe's best examples of a neolithic village. The community contains stone beds, shelves, and even an indoor toilet linked to a stream. Food sources of the early hunter-gatherer humans of the Paleolithic Age included both animals and plants that were part of the natural environment in which these humans lived, often animal organ meats, including the liver, kidneys, and brains. They consumed little dairy food or carbohydrate-rich plant foods like legumes or cereal grains. Current research indicates that two-thirds of the energy was derived from animal foods. The fat content of the diet was believed to be similar to that of the present day, but the ratio of the types of fats consumed differed: the Omega-6 to Omega-3 ratio was about 3:1 compared to 12:1 of today. Near the end of the last ice age, 15,000 to 9,000 years ago, a large scale extinction of large mammals (the mammalian megafauna) occurred in Asia, Europe, North America, and Australia. This was the first Holocene extinction event. This event possibly forced modification in the dietary habits of the humans of that age and with the emergence of agricultural practices, plant-based foods also became a regular part of the diet. A report in the National Geographic News indicated that "the first wine-tasting may have occurred when Neolithic humans slurped the juice of naturally fermented wild grapes from animal-skin pouches or crude wooden bowls." Prehistoric art can only be traced from surviving artifacts. Prehistoric music is inferred from found instruments, while parietal art can be found on rocks of any kind. The latter are petroglyphs and rock paintings. The art may or may not have had a religious function. Petroglyphs appeared in the New Stone Age, commonly known as Neolithic period. A Petroglyph is an abstract or symbolic image recorded on stone, usually by prehistoric peoples, by means of carving, pecking, or otherwise incised on natural rock surfaces. They were a dominant form of pre-writing symbols used in communication. Petroglyphs have been discovered in different parts of the world, including Asia (Bhimbetka, India), North America (Death Valley National Park), South America (Cumbe Mayo, Peru), and Europe (Rock carvings at Alta, Finnmark, Norway). Rock paintings were "painted" on rock and were more naturalistic depictions than petroglyphs. In paleolithic times, the representation of humans in cave paintings was rare. 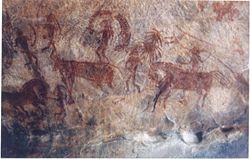 Mostly, animals were painted: not only animals that were used as food but also animals that represented strength like the rhinoceros or large cats (as in the Chauvet Cave). Signs like dots were sometimes drawn. Rare human representations include hand prints and half-human/half-animal figures. The Cave of Chauvet in the Ardèche département, France, contains the most important preserved cave paintings of the paleolithic era, painted around 31,000 B.C.E. The Altamira cave paintings in Spain were done 14,000 to 12,000 B.C.E. and show, among others, bison. The hall of bulls in Lascaux, Dordogne, France, is one of the best known cave paintings from about 15,000 to 10,000 B.C.E. The meaning of the paintings remains unknown. The caves were not in an inhabited area, so they may have been used for seasonal rituals. The animals are accompanied by signs which suggest a possible magic use. Arrow-like symbols in Lascaux are sometimes interpreted as calendar or almanac use. But the evidence remains inconclusive. The most important work of the Mesolithic era were the marching Warriors, a rock painting at Cingle de la Mola, Castellón in Spain dated to about 7,000–4,000 B.C.E. The technique used was probably spitting or blowing the pigments onto the rock. The paintings are quite naturalistic, though stylized. The figures are not three-dimensional, even though they overlap. Modern studies and the in-depth analysis of finds dating from the Paleolitic Age indicate certain rituals and beliefs of the people in those prehistoric times. It is now believed that activities of the Paleolithic Age humans went beyond the immediate requirements of procuring food, body coverings, and shelters. Specific rites relating to death and burial were practiced, though certainly differing in style and execution between cultures. Several Paleolithic Age-dated sites in different parts of the world indicate traces of dancing, dancing in files, and initiation rites. A lot of what scholars write about Paleolitic religion is speculation. However, it is surmised that Paleolithic humans thought that spirits inhabited not only animate but also inanimate objects. When they ate animal parts, they acquired the swiftness or the cunning or the strength of that animal. The world's existence may have been explained with reference to a male and a female God copulating and producing the elements. Fortune and misfortune was explained by saying that the deities were pleased or angry. Since trees and stones also had spirits, the world was regarded as at least semi-sacred. Objects, too, were to be respected. In a simple way, Paleolithic men and women may have achieved a balance with their environment, in which there were many dangers but also much that made life more bearable. Some scholars have speculated that primitive magic was used to try to control the wind and the rain but that when this proved unsuccessful, supplication was made to the spirits of the elements instead. In this view, magic was a type of primitive science, while religion was a projection of responsibility onto imaginary beings. Paleolithic people appear to have prayed for the welfare of community, rather than of individuals, so that individual welfare and group welfare merged. It has been speculated that morality was agreed through discussion. Anthropologists have used several tribes to study and interpret what life during the Paleolithic Age might have been like. Such tribes can be found in Papua New Guinea, Andaman and Nicobar Islands (India), Philippines, Africa, and South America. One aspect of the life and practices of these tribes is their respect for the natural environment, which they often believe to be sacred. There is a sense not of owning the earth but of being owned by it. Later, especially following the Industrial Revolution, humanity would so exploit the earth's limited and often non-renewable resources so as to seriously endanger planetary survival. The merging, too, of individual with community welfare is different from the individualism of the modern age. Lessons can still be learned from Paleolithic humanity. As a slang term, "Stone Age" can be used to describe a modern civilization or group of people that live in relatively primitive conditions, even though its use is often a misnomer. The phrase, "bomb them back into the Stone Age," implies a fierce attack that utterly destroys its target's infrastructure, forcing its survivors to revert to primitive technology in order to survive. Some Christians who believe, based on Archbishop James Usher's chronology, that creation dates to 6,000 years ago (4004 B.C.E. ), do not necessarily reject the existence of a stone age but would shorten its duration, possibly identifying it with the period between Adam and Eve in the Biblical narrative, and Noah, which is taken to have been a period of 1656 years. Others regard the Bible as a source of spiritual and theological truth rather than as a strictly historical account and suggest that the genealogical tables were never intended to serve as an indicator of the date of either creation or of the flood. ↑ Annecollins.com, Diet and Eating Habits in the Stone-Age. Retrieved May 29, 2007. ↑ William Cocke, First Wine? Archaeologist Traces Drink to Stone Age. Retrieved May 29, 2007. ↑ M. Hoover, "Art of the Paleolithic and Neolithic Eras. Retrieved May 29, 2007. ↑ Rice University, Paleolithic, Mesolithic and Neolithic Art. Retrieved May 29, 2007. ↑ Flints and Stones: Real Life in Prehistory, Burial and mysticism in prehistory. Retrieved May 29, 2007. ↑ Macrohistory, Hunters, Gatherers, Growers and Gods. Retrieved May 29, 2007. This page was last modified on 11 January 2019, at 19:37.